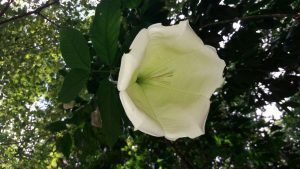 Our Botanic Program focuses on rare, endemic, and threatened species of plants. We collect, germinate and plant native species, including fruiting trees, palms, and flora that attract wildlife for food, nest sites, and shelter. By propagating these species, we are re-creating habitat and also attracting wildlife or “re-wilding” this former pastureland. 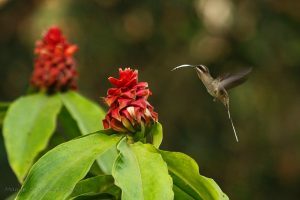 The spectacular natural setting in the Osa provides us an exciting opportunity to educate local and international visitors about the importance of the region’s incredible plant diversity and create a deeper connection between people and plants. 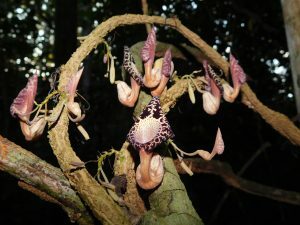 There are very few botanic gardens in the wet tropics where natural ecological processes and interactions play out right in front of your eyes – but in the Osa, visitors can easily spot spider monkeys dispersing fruits, hummingbirds pollinating flowers, and an extensive assortment of native flowers covered with butterflies. Designed for locals, international students, and ecotourists, our botanic garden features a small greenhouse and miles of trails that are an ideal educational resource for those using our facilities as a research and training site. 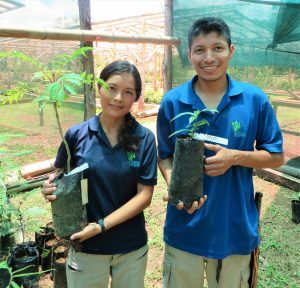 In our nursery and planting programs, we work on the germination, collection, and rewilding of native plants, including fruiting trees, palms, bat nesting plants, pollinator plants, bromeliads, and many others. A variety of endemic plants are grown in our greenhouse before planting. Botanic experts, Ruth & Marvin, work hard collecting, germinating, and planting an array of flora. 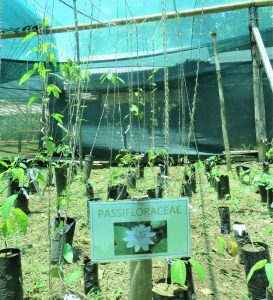 Creative strategies in our nursery help some plants like the Passifloraceae grow. A species we consider especially important is the wild papaya (Vasconcellea cauliflora). This wild species is of interest because it is resistant to diseases affecting commercial papaya. We plant this special species to attract wildlife and our kitchen also prepares them as delicious treats for visitors. 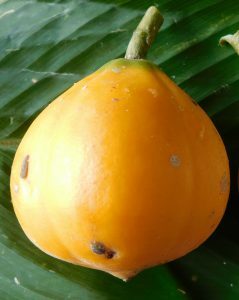 Wild papaya can be found throughout our property. 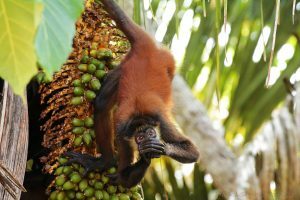 When ready for harvest, wild papaya can be a delicious snack! 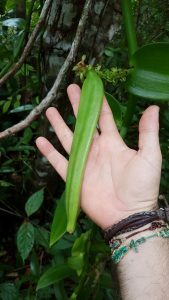 Our Botanic Program also researches native vanilla species, working alongside Dr. Adam Karremans from Jardin Botanico Lankester and his colleagues from the University of Costa Rica and Charlotte Watteyn (a PhD student KU Leuven University, Belgium). Rewilding vanilla by attaching them to trees & natural fences. 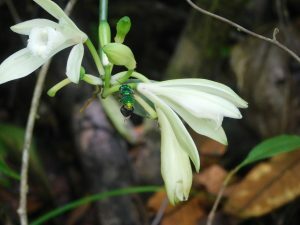 Pollinators of wild vanilla can be quite elusive. Here, we see an orchid bee checking it out. 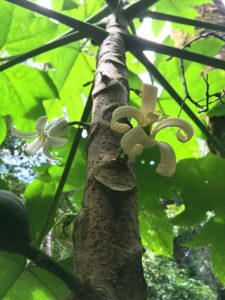 Together, we are investigating how vanilla orchid flowers use a variety of intricate strategies to attract pollinators. 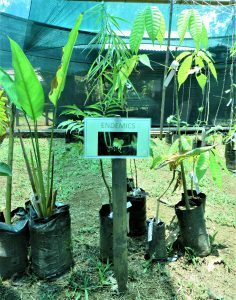 This is part of our goal to cultivate wild vanilla in our secondary forests and restoration areas in the Osa Peninsula. 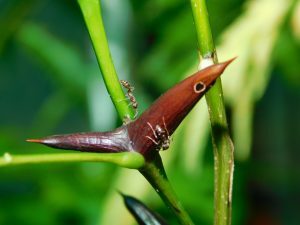 Vanilla pods growing in the wild. 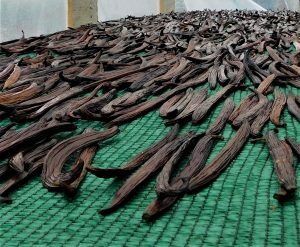 A workshop with partners demonstrated how to harvest vanilla beans.